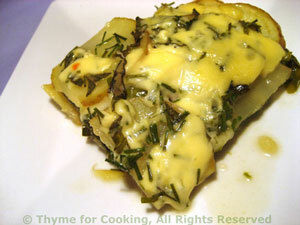 Potato and (Swiss) Chard Gratin, from Thyme for Cooking. A simple, dish with few ingredients, this highlights the fresh taste of chard (Swiss Chard) in summer. Use a deep dish and pile it high. It wilts and compacts as it bakes. Add the cheese at the end or it all ends up on the foil. 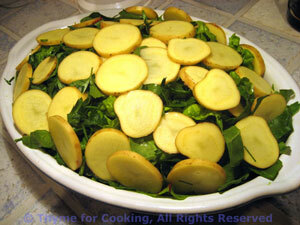 The top layer of potatoes looks a bit strange balancing on top of the chard, but it all comes together. Stack the leaves together and fold over, the long way. Slice into thin strips, about 1/2" (1cm) using both leaves and stems. With a sharp knife thinly slice the potatoes. Lightly oil the bottom of a deep (1 1/2", 4cm) baking dish. Spread half of the potatoes in a layer on the bottom. Pile the sliced chard on top. Drizzle the hot stock over the top and press down as best you can. Lay the rest of the potatoes over the top. Cover with foil and bake, 45 minutes, at 200C (400F). Remove dish, uncover, lay the cheese over the top and return to oven for 15 minutes longer.